James Joyce’s work is notorious for resisting good film adaptations. So much of his stories take place inside a person’s mind and is colored by his wonderful grasp of language that the actual events of the book pale in comparison to the internal musings. The most obvious example of this is his famous book Ulysses where a man wonders a beach, eats a meal and generally does mundane things on a foggy day in Ireland. To watch a man in period dress wander a beach with no context is not very stunning cinematically. But this seemingly active resistance to a visual medium did not prevent directors, actors and screenwriters try their hardest to adapt every work of Joyce’s with varying success. John Huston took a more pragmatic look and tried to adapt only a short story of Joyce where there are more conventional events taking place. I think he chose wisely. The Dead takes place on Christmas night in Dublin around the turn of the last century. A warm house bright with candlelight is filled with relatives, friends and old acquaintances of the a group of three generations of spinster music teachers. Although there are several colorful attendees, the focus seems to be mostly on the arrival of Gabriel Conroy and his wife, Gretta. Once they have arrived, drinks, performances, and dinner are all introduced in round order. Little incidents happen, but nothing that seems out of the ordinary for these music loving cohorts. Once the dinner has finished, people start to leave. Gabriel helps a couple of elderly people into a carriage and goes back into the house to get Gretta. As Gretta descends the staircase, one of the still present guests, an opera singer, sings a beautiful and sad song. She pauses and listens, obviously affected by it. As the couple goes home, Gabriel can sense that his wife isn’t quite herself. He tries to get her to talk about it, but she resists. It isn’t until they are in their hotel room that Gretta reveals why that song changed her mood so completely. The revelation (which is pretty monumental so I won’t reveal it here) about Gretta’s past life affects Gabriel in a way he didn’t expect. As he watches her sleep, he mediates on love, death and the changing of the seasons. This movie is really two movies in one. The Christmas dinner party seems to be filled with life, warmth, and musings on the nature of art. But that feeling leaves immediately when Gretta pauses on the stairs. The rest of the movie seems to be an internal battle over conquering sadness. The warmth of the previous scenes is replaced by the harsh dark winters Dublin seems to always have. Although I didn’t know what was coming, I could tell that Gretta the dinner party guest was going to be gone by the time she reached the bottom of the stairs. That shot is probably the most arresting of the movie. 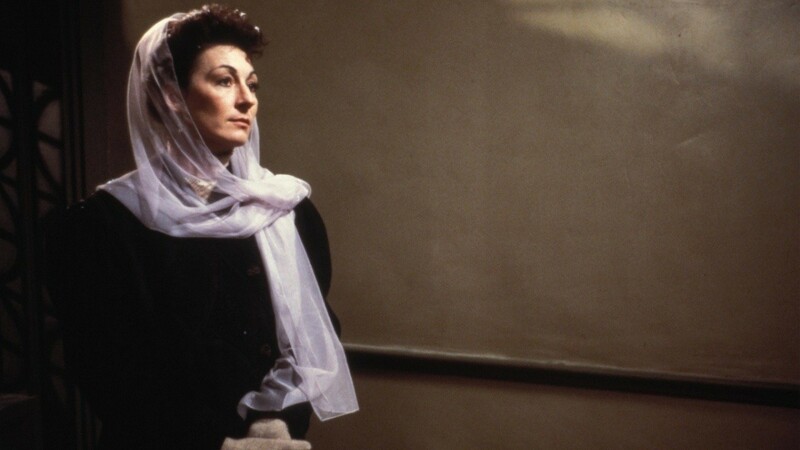 The shot is simple with a backlit aura placed behind a beautifully dressed Anjelica Huston, but the look on her face says so much more. All of a sudden a bright, happy young woman becomes a deeply saddened older woman. Only a father dying can capture that sense of loss in their daughter. What is great about this movie is that you can watch one of two ways. Either watch it for its surface constructions and see a meticulous period piece or watch it for the hidden philosophical leanings that Huston injected by way of Joyce’s story. Either way I think you will get something out of it.